Great Uncle Jack (John Horton, left) and his younger brother, my grandad (Alfred Noah Horton). Footherley, early 1960s. The last time I went to Fishpond Cottage was in about 1968, soon after my dad’s Uncle Jack had died. Whoever now owned it, or, for all I know, had owned it all along, wanted it completely refurbished, and had engaged my dad to do the job. No one was living in the old place, so, as was often the case, I happily tagged along with him. We turned off from the busy Chester Road, away from the modern world, through that most secret gap in the trees, and bounced along on what seemed to me a long, curving lane between the woods and the quarry in our van. I can just about still bring to mind an impression of a large, gloomy living room with a beamed, low ceiling. In it was a black varnished piano, whose keys I was allowed to bang tunelessly on. It must once have been Uncle Jack’s or Aunt Gertrude’s. She had been gone a few years. I remembered overhearing the story of how, after her very last breath, when Uncle Jack opened the window of her room at Fishponds to release her soul, he literally saw a milky vapour rise from the bed and leave. So whichever spirit haunted the place, it wasn’t her. There wasn’t much that my skilful dad couldn’t do for an old building like Fishpond Cottage. He could lovingly re-point the old brickwork that had sheltered members of our Horton family during the past 7 decades. He could re-plaster walls as smooth as glass, and chamfer just the right bit of wood to make good the loss from rot on an old lintel. Electricals he left alone. His sparky was a great big chap from Lazy Hill Road. This man normally had a very puffed-up demeanour, but my dad received a breathless phone call from him late one night after he had been working alone at Fishponds, and without giving much detail, he said that under no circumstances was he ever, ever, going back there. The Fishpond Cottages, at some point, became a single dwelling: – A rangy, white rendered affair that has changed hands in the last couple of years for a sum that would make my great uncle’s and my granddad’s mouths drop open in astonishment. Back in the 1900s, there were four distinct households at Fishponds, living in what seem to have been three humble four-roomed cottages. From at least 1901, one of these housed Gertrude and her numerous brothers and sisters – a family headed by her father John Horton, related to me via two or three branches of my family tree. By 1911, my great grandfather Thomas Horton also lived in another one of the cottages, with his wife Elizabeth, and their two youngest children – that is, their sons (Alfred) Noah – who would become my grandad, and John (Uncle Jack). 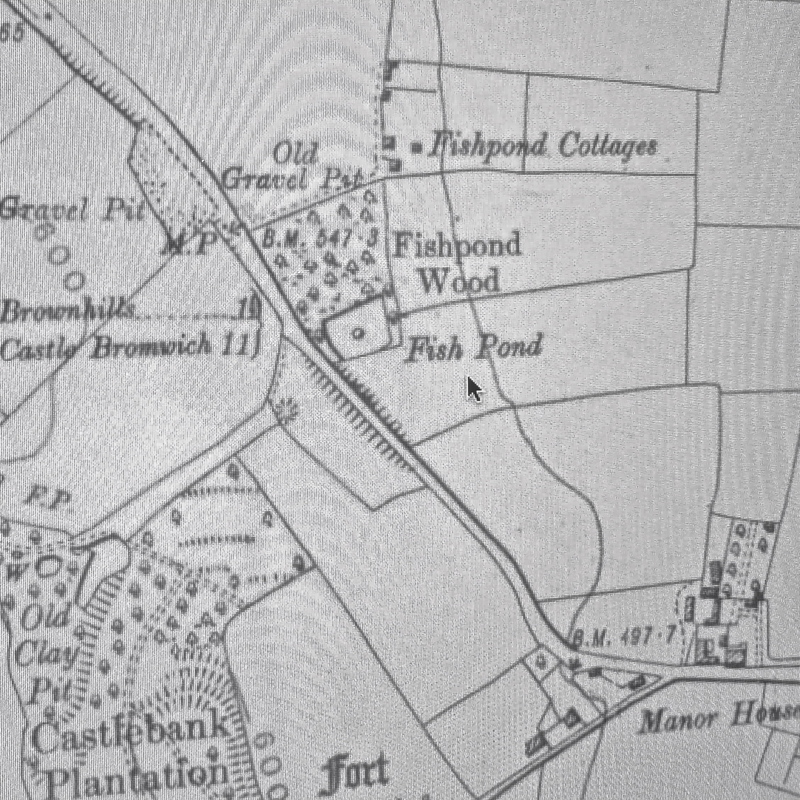 Fishponds was a strange place to live, when you think about it: Isolated, unconnected to the nearby settlements of Stonnall or Walsall Wood, which were, even so, so near; hemmed in by trees and the adjacent excavations. I don’t see the cottages mentioned by name earlier than the turn of the 20th century. Could they have been constructed for workers at the quarry? If so, how come my grandfather and his family ( then coal miners), and his cousin, Gertrude’s father, John ( a bricklayer) lived in them? And what of the Fish Pond itself? Clearly marked on maps contemporary with my family’s occupation, just how old was it, and why was it significant enough to give its name to the wood, and the cottages? Was it, as it appears to me, man made? What was its connection with the Iron Age Hillfort of “Castle Hill,” looming on the other side of the Chester Road? 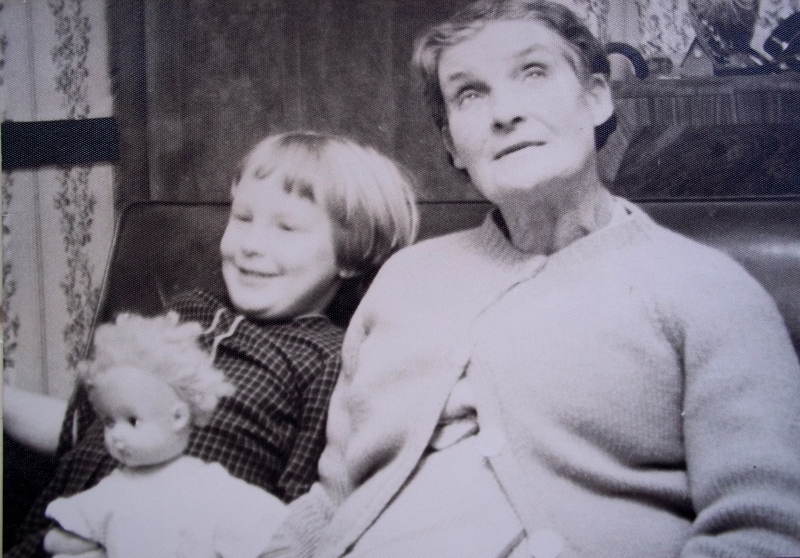 By the 1960s, only Uncle Jack and Aunt Gertrude remained at Fishponds, and our association with it ended soon afterwards, when the required work on the cottage was completed. Their parents were long dead, of course, and I don’t know when Gertrude’s remaining siblings had drifted away. Records show that her pigeon fancying brother Bert seems still to have been knocking about at Fishponds according to an account of a hearing at the Brownhills Petty Sessions in August 1934: A fauna-based fracas involving a rabbit, a pigeon and a duck resulted in a telling off from Mr Cooper, the prosecutor, and payment of costs, with the pugnacious Horton brothers and their associate John Seedhouse bound over to keep the peace. Lichfield Mercury, 10th August 1934. 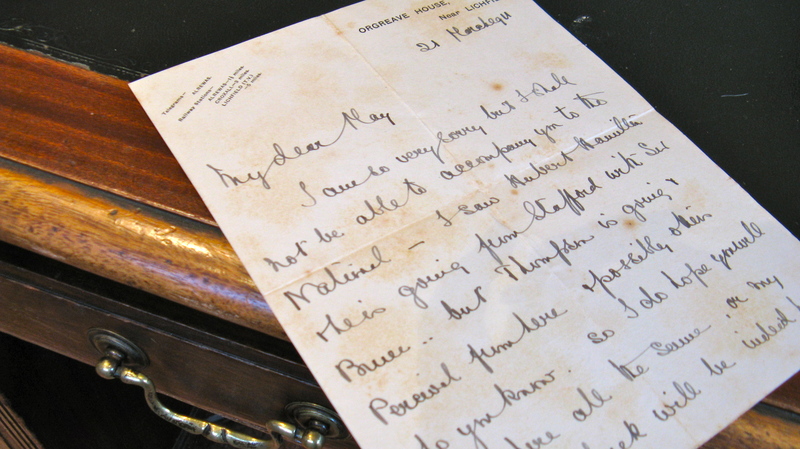 …………Fragments of hand written notes come to me from my Aunt Mary about her early years in Stonnall and Walsall Wood, and married life in Lynn Lane, transcribed by my cousin Rosalind. Along with stories I remember her telling me, these form the entire basis of what follows…..
There’s yet another commotion in Aldridge Road. What is it now? It’s now a bit late in the morning for it to be poor Jimmy Pitt, who came back “touched” from The Great War a couple of years ago. With a broom stale under his arm, gruff and hysterical, it would be grey dawn at The Vigo when he had loudly drilled his imaginary troops on the pavement, just as the neighbours on “earlies” left him behind on their way to the pit. Whatever this fracas is, it must be something sensational to be causing people to rush across the street in such numbers that Mary Horton has no hope of observing proceedings properly from street level. So she darts back under the brick arch and through the entry, to the rear of the tightly packed row of two up, two down, terraced cottages, and into to the yard where the privies steam gently behind their gappy wooden doors. Now she can get into their house through the scullery, and bolt up the narrow, enclosed staircase to the front bedroom, a perfect vantage point. This is the room where, come 1925, my father, Edwin Noah Horton would be born: Mary’s last little brother, and the final child in this, particular, Horton brood. I can drive myself a few miles, morbid and eccentric, and stand within this very column of empty but significant air right this minute, if I so wish. But my toes would dip into the modern day gutter and I am in danger of having them amputated by much passing traffic at the top of what was once Aldridge Road, but is now called Northgate. Behind me, three or four boring modern houses sit behind their small front gardens on the very spot where a score of crowded households birthed and were bereaved in the shadow of the collieries and the brickworks early in the last century. Above me, on my precarious kerb, and in another time and space, the child, copper haired Mary, presses her high forehead (a characteristic of our family physiognomy that I share) eagerly against the window pane, sapphire gimlet eyed towards the place from which, this particular day, the screams are issuing…………. No, not yet time for my father, but there had been a baby in Mary’s house recently. Little Margaret May Horton had been dressed up far finer and fancier than Mary or even sister Nellie (and she “the pretty one”) had ever been. Mary had spied her – lying still, waxen and be-ribboned – in a wooden box, on a high shelf that Mary was supposed not to be able to reach. For days, before the funeral, she believed that, beyond her wildest dreams, her parents had procured a beautiful doll that she might be able to play with ostentatiously on the front step. What exquisite envy that might have inspired in the hearts of Aggie Mushkin, Louie Beardmore, and Dolly Cowley, who also lived in the row. The boys in the gang (each of the five roads that meet at The Vigo has its own) had other fish to fry. But Mary remembered she was often up to mischief with them, that is, Mushy Tolley, Bachy Pinches, Mary’s brother Bill and cousin Jimmy. We tormented the lamplighter by following him and shinning up the lamp post and pulling the chain which put the light out – then shouting ” Your lamps gone out !”. We helped ourselves to fruit from a cart pulled by a small pony. Pony quietly waited for his boss to come out of the pub. Guess who carried the fruit down the entry for the share out ? ME.. the only one with a skirt. We tied door knobs together, knocked the doors and watched the struggle to open the doors. We rubbed wet fingers on windows which produced a sound quite unbearable. We followed courting couples up dark lanes sniggering aloud when they went into a clinch and got chased for our pains. Dad called us in about 9 o’clock. Mary also read avidly: “Peg’s Paper,” “Red Letter,” and, when she could get away with it unnoticed, “The News of the World” with its salacious tales of horrible murder. That was alright in print, but did she really want to look at what was transpiring across the road? No, but she couldn’t take away her eyes from the scene. And whose house was it? Across the road from where we lived were five houses in the shape of an L upside down. The first house was used as a barn Mr Tolley kept his pony, cart, hay, straw and all kinds of things in it. He was a stone breaker for the roads. He once showed me a stone he had just broken, it contained a space in the shape of a caterpillar. The stone was the size of a big potato. Next to the barn was the home of Lottie Pinches and her family, then Tolley’s house. Mrs Tolley wore a dark coloured bustle dress, floor length, when she walked she appeared to float. For weeks I was terrified to look through the window across the garden to the tree. As soon as my eyes closed I saw the hand squirming out of the ground, fingers flexing as though looking for the body, I was sure if it saw me it would ” cotton on ” to me. Can’t remember how long my fear of the hand lasted. It seemed a long, long time. She had poured a can of paraffin over herself and set herself on fire. 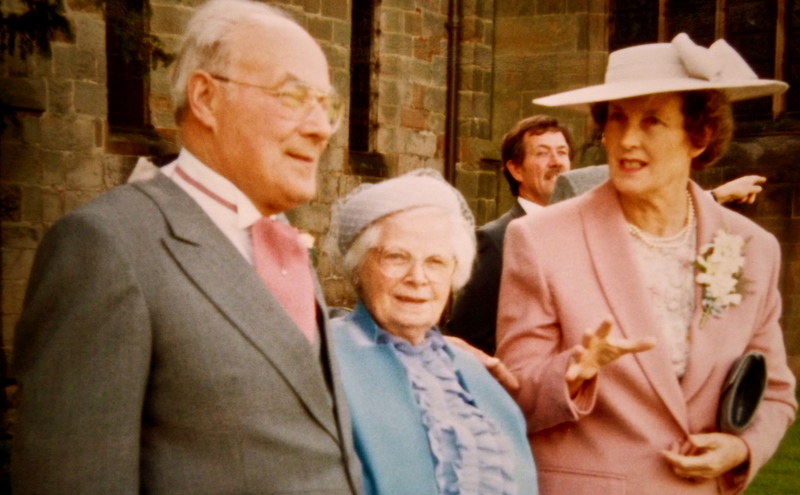 Aunt Mary, on a visit back to Staffordshire in 1992 for my wedding. Her little brother, Ted, my dad, has his arm around her. They always remained close. For the first four years of his life, the family lived at The Vigo. I wonder whether Orgreave House feels uncertain…. and a little wistful…. about its identity? After all, if it wasn’t for its gracious neighbour, the Queen Anne mansion of Orgreave Hall, it would be the largest and most imposing dwelling in our hamlet. And its architectural personality is full of contradictions. It turns its Sunday face to the south. Bay windows bulge from its two principal reception rooms, scanning a large, sweeping lawn, that is adorned by a majestic cedar tree. The formal entrance drive – protected by a surprisingly substantial cattle grid – curves its way through mature rhododendrons, that welcome visitors with large gaudy blooms in the springtime. But if you should make the muddy trudge to the rear – tradesman’s – entrance, where a gate leads into a generous courtyard bordered with outbuildings, the house squints at you as you pass the utilitarian windows of its north facing service rooms. On this side, the building abuts immediately onto the now blind ended track, that long ago and for many centuries gave access past the site of the Hall to Alrewas and beyond. No longer troubled by the passages of cart, pack horse and pedlar, instead it endures its proximity to what is a rutted shunting area for Hall Farm’s big, busy, blundering, pea-green tractors. And the north-eastern corner of the house terminates most oddly in a single, foursquare crenellated tower. The Orgreave House of two hundred and fifty years ago I imagine as a neat and almost symmetrical Georgian building, that still secretly forms the south-western core of the present house. Much later “improvements”, including the tower, the parapets atop the porch and bays, and the asymmetrical extension to the east, suggest inspiration drawn dilutely from the Gothic Revival style. 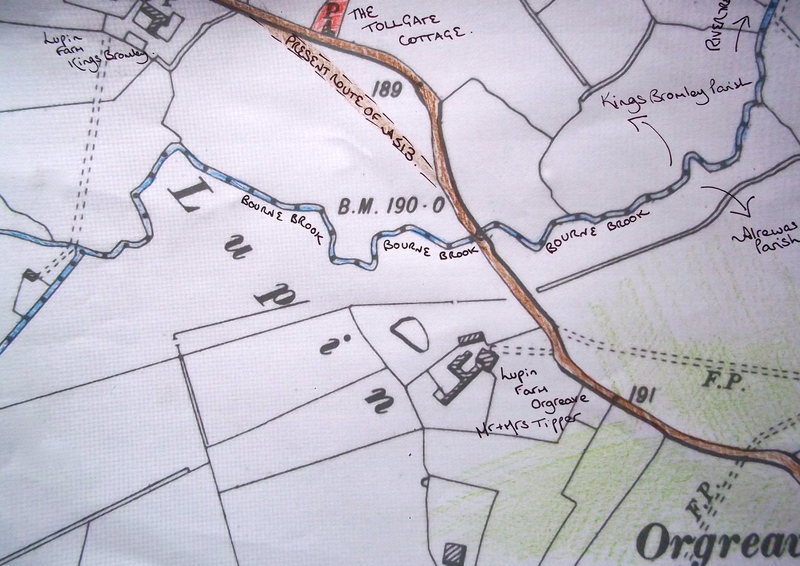 Annotated map of the Orgreave and Alrewas estate, from circa 1760, the original of which is kept at Stafford record office. 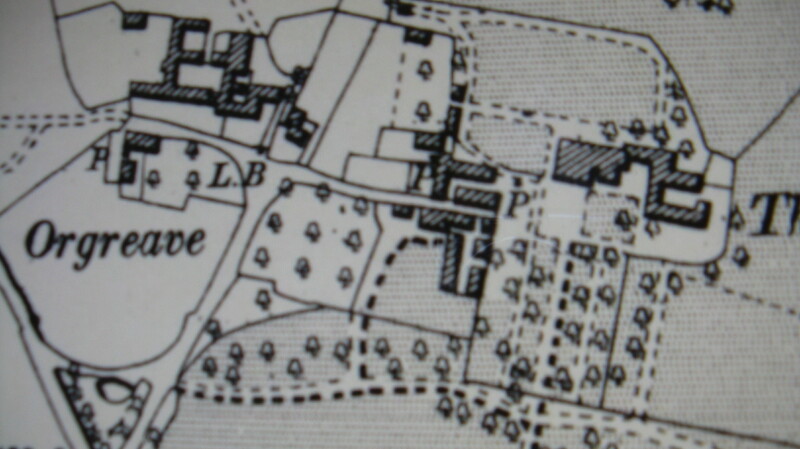 Since then, a tennis court (shaded blue) has been laid against the site of a now extinct cottage, its grounds subsumed into Orgreave House’s extended gardens. Indicated in red, a bulky extension has created an East Wing, and the space between the building and the lane has been filled in, partly by the tower. 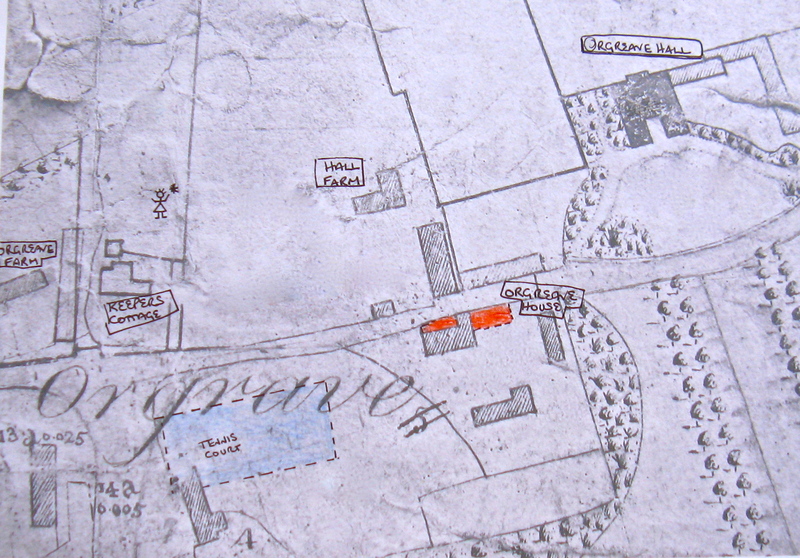 A map held at Stafford Record Office helps to put this house into context in mid 18th century “Orgrave” – as the cartographer spelled it – probably during a survey conducted in connection with the purchase of the Alrewas and Orgreave Estates by Admiral Lord Anson from the Turton family. At the end of the 19th century, alterations to the house, and development of the outbuildings to provide copious stabling were undertaken by Mr. Henry Edward Audley Charles, with assistance from Walsall architects H. E. Lavender. The Lichfield Mercury of 29th November 1901 speaks of veterinarian Mr Charles’ “equine veterinary hospital” at Orgreave House, although he had been at pains to publicise, via his own advertisement in the newspaper that year, that his “shoeing forge” had been transferred from here to Frog Lane, Lichfield. Mr. Henry Edward Audley Charles was a scion of the affluent Charles Family of Pelsall Hall, but his family had deep roots in Orgreave: His grandmother, Catherine, who married Thomas Charles at All Saints Church, Kings Bromley on Christmas eve in 1816, had been born in Orgreave. Her father, Henry Smith, is described – in his will of 1817 – as a Yeoman, in possession of the copyhold and freehold of various local tracts of land. Catherine and Thomas’s second son, Abraham Charles, took up some of his matrilineal inheritance at Orgreave, where he settled with his wife, Hephzibah. Their son, Henry Edward Audley Charles was born at Orgreave in January 1871, but, sadly, the beautifully named Hepzibah died only weeks later. 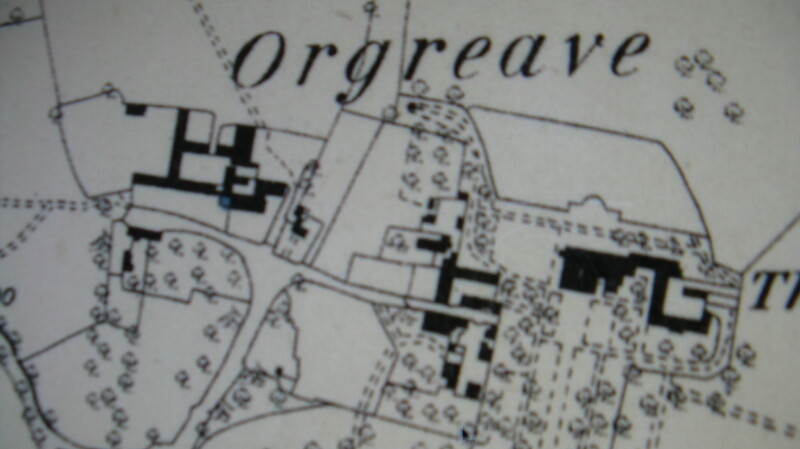 Happier times, perhaps, are captured by the enumerator of the 1901 census as he visited Orgreave House. Now 30, Henry, the successful veterinarian, and his wife Kate, live here with their eight year old daughter Muriel and her three younger brothers, Edmond, John, and Hugh. A governess and nurse are on hand to take care of the children, whilst a groom and two maids attend to other domestic duties. Intriguingly, the whole family shortly up-sticks and emigrate to Canada, where Minister of the Interior, Clifford Sifton, was pursuing a vigorous policy of inviting suitable new citizens to his country. Farmers were preferred, but opportunities must have been manifold for an expert equestrian vet, in that horse powered age. Orgreave House is thus available to let. What sort of tenant would be soothed by the familiar toy-fort tones of its nether reaches, and appreciate the ample accommodation available for their grooms and horses? Who better than senior army officers, from the local Whittington Barracks? I am so very sorry but I shall not be able to accompany you to the National – I saw Herbert Hamilton & he is going from Stafford with Sir Bruce….but Thompson is going and Percival from here & possibly others who you know. So I do hope you will come here all the same, or my slump of luck will be indeed be heavy so au revoir on Thursday. The old charmer. Did May manage to rendez-vous with the party at Orgreave that Thursday, I wonder, and travel with Percival to Aintree? Did she arrive unchaperoned, with her huge hats and her furbelowed skirts to what was an almost exclusively masculine menage at Orgreave House? Just a week or so later, on Sunday April 2nd, 1911, in Gorringe’s distinctive, confident handwriting, he makes a list of his household for that decade’s census, noting that the house boasts a plentiful 20 rooms. The Brigadier General, his brother, Leonard, and the horses, are being cared for by a staff of eight young men – a butler, footman, orderly, kitchen boy, gardener, and three grooms. The gardener’s new wife, Sarah Powell, Gorringe’s cook, is the only woman in the place. Contrast this manly crew with the staff controlled by the butler in the employ of William Edward Harrison at nearby Orgreave Hall – it is its mirror opposite. There, Mr.Bird finds himself in charge eight female staff – cook, lady’s maid, and a small flutteration of young maids and children’s nurses – this a much more typical profile, as female domestic staff are both more numerous and considerably cheaper than their male counterparts in 1911. George Gorringe was a bachelor in his forties during his appointment at Whittington between 1909 and 1911. Over 20 years in the regular army had seen him actively – and effectively – involved in a remarkable six military campaigns. During the Mahdist War in the 1890s in Sudan, he brushed shoulders with both Winston Churchill, and the more famous Lance Corporal Jack Jones. 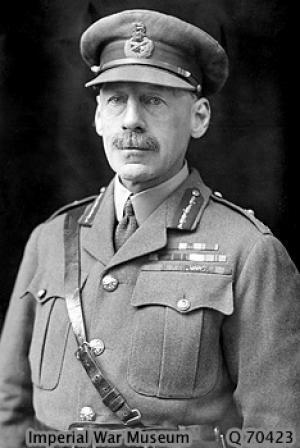 When Corporal Jones’ mentor, Lord Kitchener, had secured the reconquest of the Sudan at the Battle of Omdurman, and overseen the first steps in rebuilding Khartoum ( a process in which Gorringe was said to be closely involved), Gorringe left Sudan for South Africa with Kitchener, as his temporary Aide-de-camp. During the Boer War, Gorringe cemented his reputation as an effective soldier, although his heirs have judged him harshly for his role in the execution of justice against civilians who he deemed to have been assisting the Afrikaner enemy. How strange life must have been for him, marooned here in Staffordshire, in temperate weather, with no apparent threat to his life, an active social life to conduct, and the prospect of semi-retirement in “staff” roles for the rest of his career. He doesn’t sound like a fellow that May would have recognised. I paused – for the purpose of taking this photograph – from heaving my wooden spoon around the luscious, peaty amalgam of this season’s rather late Christmas Cake. This huge and precious old Mason and Cash mixing bowl had only just come into my possession as a Christmas gift from my aunt, Irene, and I couldn’t wait to try it out. There was here only one scant week of advent remaining for the piercing and dripping of strong brown drink to ‘feed’ the uniquely stiff and fragrant mixture, glistening both tawny and ruby with the fruits of exotic tree and vine. The recipe that has evolved into “Christmas Cake” was, historically, prepared for consumption on Twelfth Night, January 5th, rather than Christmas Day. Our cake, now iced, beribboned, and adorned with some bristly little fake conifers and a small herd of plastic deer, should be fit for consumption by then. This big bowl won’t fit into any of my cupboards but it is a pleasure to have it readily to hand to knead my bread dough in its roomy interior. The open angle of the cross-section, the grippable raised lip, and the weighty stability of the whole, are some of its practical and distinctive attributes. It just makes the job easy. No wonder the design has endured to long. It dwarfs the useful No.24 bowl that has already been passed on to me by my mother, but which was amply proportioned for whipping up a Victoria Sponge or a few rock cakes for childhood teas to spread before our single-offspring family. No, this giant is a No.6 – almost the biggest size of the iconic “Cane” bowls (from the distinctive colour) that begun to be made by Mason Cash and Co near Swadlincote in 1901, and have not changed in appearance since, despite the company having now been taken over. 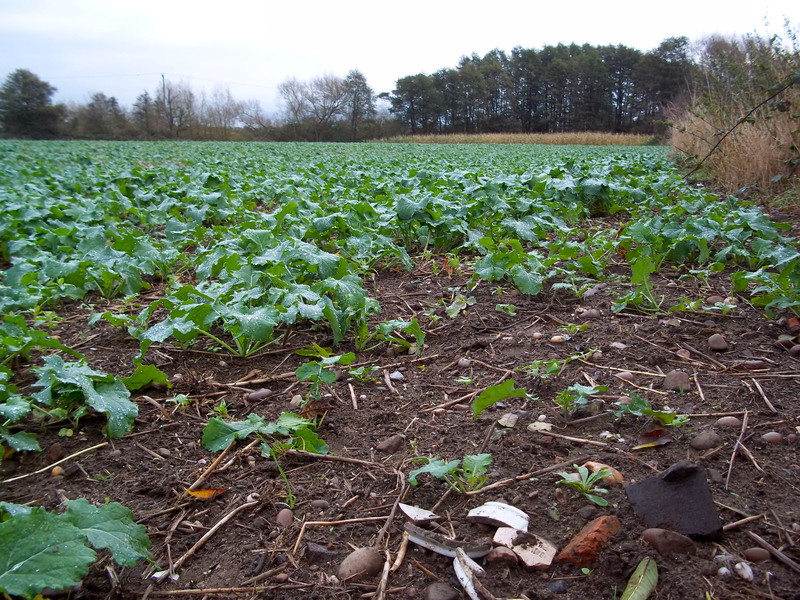 Production in Derbyshire has now ceased, having moved to somewhere much further east. The size designations refer to the number of bowls that would fit into a firing in the original Church Gresley kiln – the smaller the number, the larger the bowl. After what must be many decades of service, it has travelled with me back across the Midlands towards its place of manufacture. It comes to me with a treasured family provenance, having been handed down to Irene from her mother-in-law. What a sweet blend can be made when the miscellany of family has a new ingredient added. 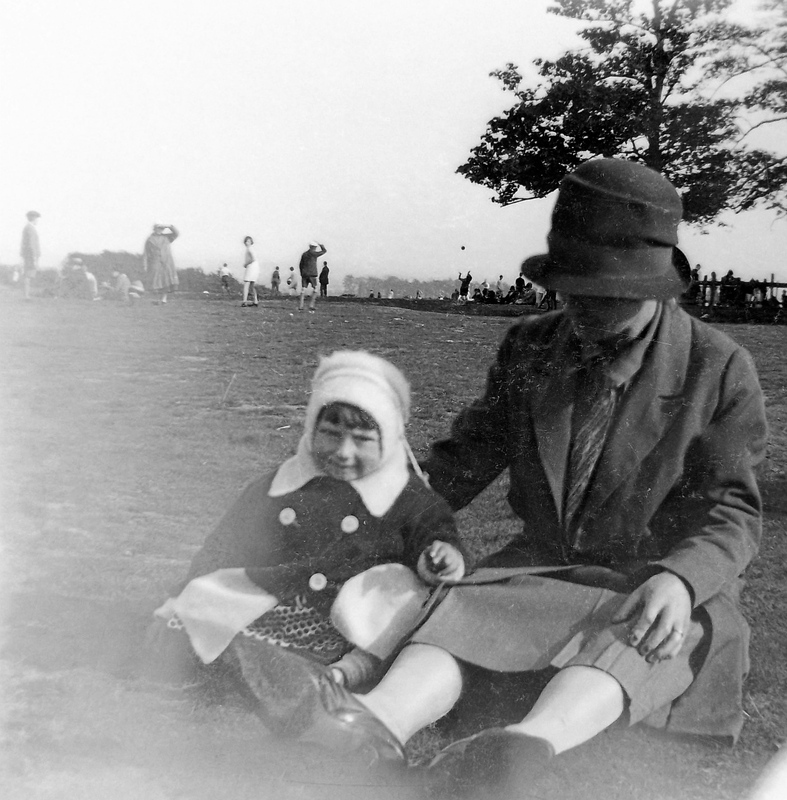 In the 1950’s, Irene – my mother’s practical, capable, and lovely younger sister – left her job as manageress of Dorothy Perkins’ Worcester shop to marry into a clan that for several generations had earned their Worcestershire living as farmers and blacksmiths, in and around Pershore, Powick, and Upton upon Severn. Here, on his wedding photograph, Trevor’s huge hands tell of the Grizzells’ genetic aptitude for wrestling their livestock into profit, or for making dancingly effortless the heaving arc of a hefty hammer onto a ringing anvil. I loved to hear the family adage that, on their wedding day, Trevor could easily encircle his bride’s waist with his two hands. This was testament to the siren slenderness of the waist, too. I remember, in my ‘teens, the treat of being allowed to try on this lovely dress. I sashayed coquettishly down the old oak staircase in the pink washed, timber framed farmhouse convincingly enough – but with one unseen hand holding together the two sides of the zip, that refused to meet around me. The compass of the voice and personality matched the hands. At 13 or 14 years old he’d greet me on family visits with a “Boiy Croist!” (his Worcestershire accent redolent of Ambridge) in mock horror at some offensive aspect of what I had believed to be a supremely stylish sartorial ensemble. He and Irene had three sons. It was fair of him, I now realise, not to discriminate either in favour or against this little girl’s well-honed sense of dignity. Before I grew too tall, I was scooped up and held, squealing, upside down by the ankles in those enormous hands, like his reared-for-Christmas poultry – with my feathers well and truly ruffled. My name is Sue; How do you do, he bawled at me, excruciatingly, a hundred times over, when, just after my 8th birthday, Johnny Cash’s song “A Boy named Sue” rocketed up the singles charts, a gift to Uncle Trevor’s gentle campaign of torture. What doesn’t kill you makes you strong. Despite my ordeals, our visits were hours of delight to me. Hours of dogs, and lambs, and my cousin Nigel’s pony. There was fruit picking in the orchard, walking the stock, and fishing expeditions (my father so chucklingly delighted on the single afternoon that my keep-net writhed with more weight of little Severn River gudgeon than my cousins’ did). And then there was the tucking in, a companionable eight of us round the kitchen table, swinging my legs happily on my chair, enjoying the feeling of belonging to the cohered group. Across the stiffly creased white linen tablecloth I observed the particular affection between my mother and her sister, and the quiet rivalry between the brothers-in-law. A tender plant, grown under glass, needs “hardening off” gradually before it is planted out permanently into the uncertain climate outdoors. It was in this spirit that my parents later allowed me away from my protected home environment for more protracted visits to Cowhills Farm, the “tied” house on the large acreage that Uncle Trevor brilliantly managed for his employers. 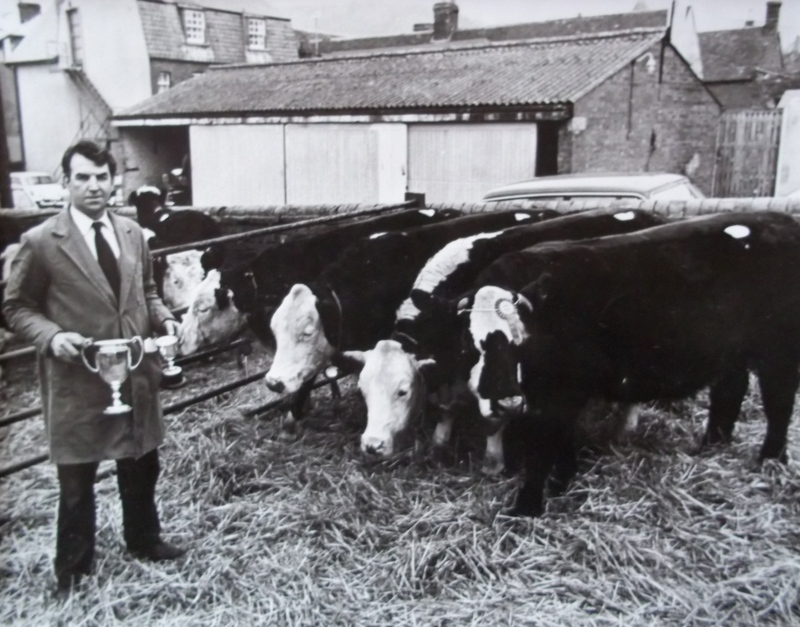 Now, intrigued and fascinated by farming to a greater extent than any of his sons seemed to be, I felt privileged to accompany him to market at Worcester, Ledbury or Gloucester, where he knew everyone and everyone knew him, a fine stockman also brimming with bonhomie. He seemed proud when my career aspirations began to coalesce into a strong desire to become an auctioneer myself. I also see my over made-up teenaged self lolling at that farmhouse kitchen table, near the warming Rayburn: sighing, pouting, and pondering about my future. 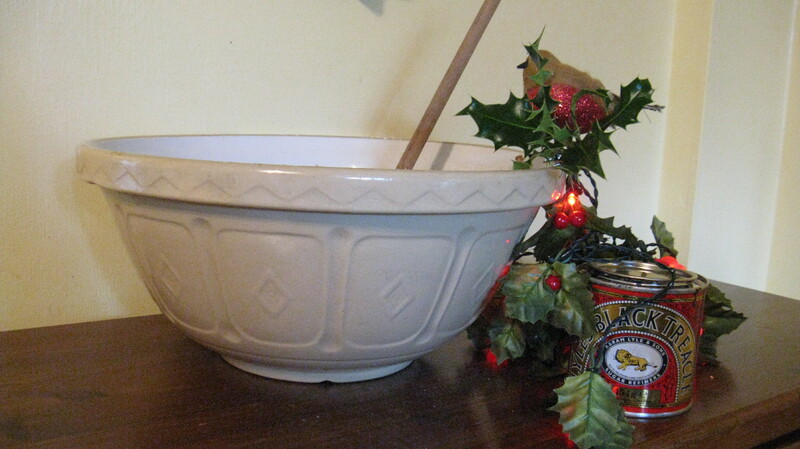 Briskly and willingly, my aunt wielded her batterie de cuisine around the obstruction – including what was to be, 30 odd years later, my prized mixing bowl. The bowl in which Uncle Trevor’s childhood cakes had in their turn been mixed. Perhaps even those of his mother, Emily, in the forge at Powick. No longer just an observer of the alchemy, a licker of the spoon, now I have to make my own cake. The site of the Old Tollgate Cottage, near Orgreave. Razed to the ground, now, as much as was 25, Cromwell Street in Gloucester or 5, College Close in Soham. An inspection of a few square feet of the field in which it once stood soon yield some russet chunks of locally-fired brick, pieces of the Rosemary roofing tiles so typical of the area, and some broken pieces of crock once part of jars and kitchenware. Note the stand of trees to the rear right of the picture which are also visible in the press photograph of the cottage contemporary to the murder. I inhabit – for the time being – a small rural hamlet strung just off the A513, and equidistant between two enduringly olde worlde villages, a few miles north of Lichfield in Staffordshire. It’s the sort of quiet place that Torment and Violence would choose to pass by, heading for the hustle and bustle elsewhere, along with the generations of mules, ponies, cycles, and latterly, motor traffic, that have travelled along what is the old turnpiked road linking Rugeley to Tamworth. But this cannot be true! As any half-interested TV viewer of one of Miss Marple’s investigations into torrid crime must be aware, turbulent human passions and and acts of brutality occur everywhere men live, and their drama is most sharply defined in the most tranquil of natural environments, such as the flattish, innocuous-looking holly-and-hawthorn bordered fields, slow streams and and little copses that are features of this stretch of the Trent Valley. The Old Tollgate Cottage, twixt Alrewas and Kings Bromley. From a contemporary press photograph. 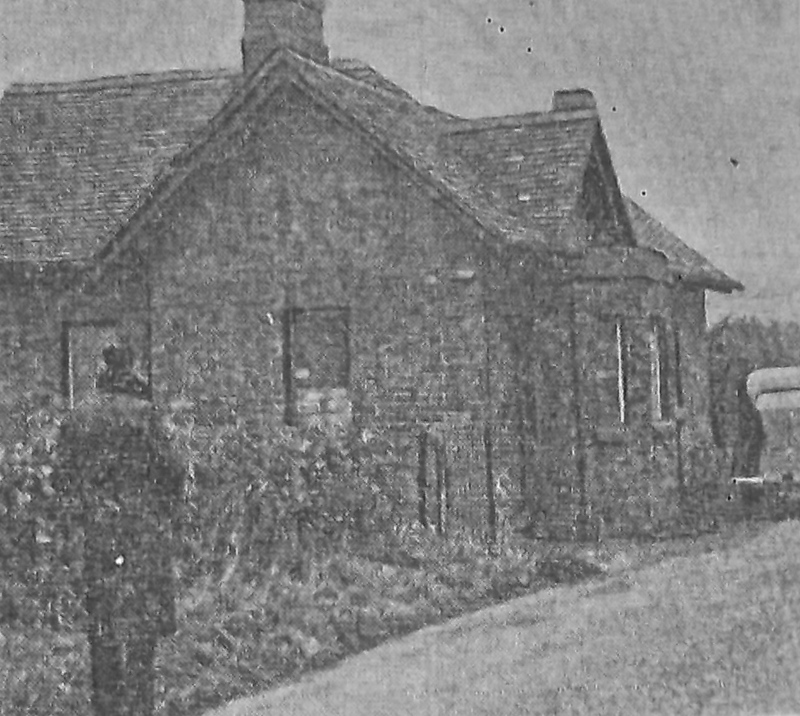 One dull October week in 1937, the roadway near Orgreave, between Alrewas and Kings Bromley was periodically thronged, according to the local press, by “morbid sightseers and motorists.” who were stopping by to contemplate the Old Tollgate Cottage, the recent scene of the tragic death of Alice Maude Morris at the hand of her husband Leslie. The lattice windows of the brick-built single storey dwelling in its “small but pretty” garden had been boarded up. Behind them, in the darkness, the table remained partly set for a meal, although there was smashed crockery on the tiled floor, and a large, sticky pool of drying blood near the hearth. It was towards lunchtime on Tuesday 19th October when Albert Dunn, the manager of the Singer sewing machine shop in Tamworth Street Lichfield, was cycling towards Alrewas. As he passed the Tollgate Cottage he was alarmed to have his attention attracted by two distressed little girls, screaming and waving their arms at him. Leslie Morris, their father, was emerging from the side door of the cottage as Mr Dunn entered to see what the matter was, and he found the body of a woman on the floor of the living room, profusely bleeding from several severe head wounds. A bloodied flat iron lay on the floor nearby. Leslie Morris came back in to the cottage behind Mr Dunn, and knelt down beside his dead wife in a heart rending state of confusion and remorse for what he had done. Mr Dunn heard him murmuring “Oh my dear, my dear! What is the matter, my dear?” , his face bending tenderly towards her poor broken head. Within the luxuriant tresses of hair that crowned Alice Maude’s somewhat ordinary-looking face, there nestled an envelope. 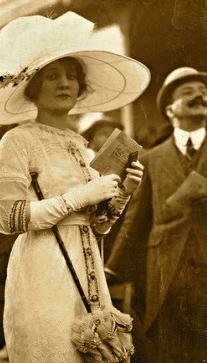 Joan Frances Morris, and Pearl Morris, from a contemporary press photograph. They must be old ladies now. I hope that the tragic events of their childhood did not blight their entire life. 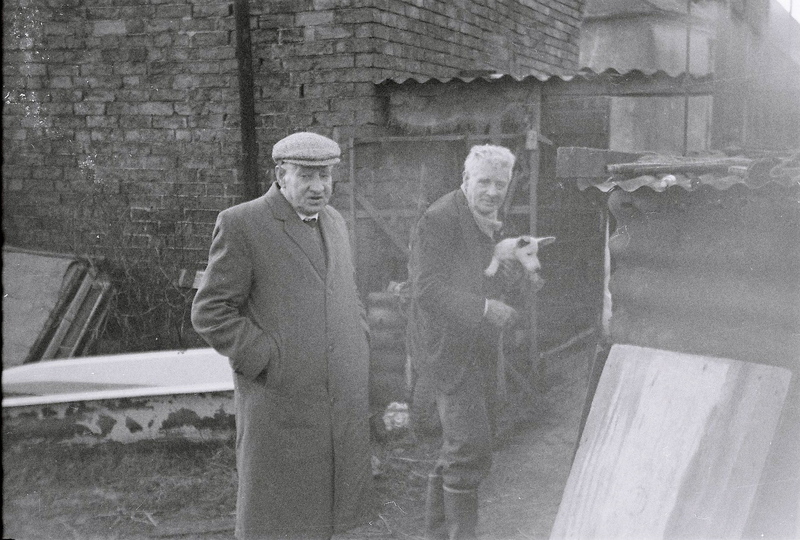 Then as now, the Tipper family occupied Lupin Farm, Orgreave, the nearest other habitation to the relatively isolated Tollgate Cottage, and the resourceful Mr Dunn crossed the quiet road to the farm hand in hand with the unfortunate children, 12 year old Joan and 8 year old Pearl, to place them temporarily into Mrs Tipper’s care, before turning his attention to summoning the police to deal with the situation, including the capture of Mr Morris, who was now making his way slowly and distractedly on foot towards Kings Bromley. A Rugeley miner, also cycling along this stretch was soon on hand to help in this endeavour. Who were this Morris family, the neighbours asked each other? They were not natives of Orgreave. William Cliffe, a farm worker who had been living alone as the tenant of the Tollhouse Cottage, had engaged a lady housekeeper to look after him, they had been led to assume, when Mrs Morris had moved in the week before, bringing her daughters with her from her native Cheshire, via the “workers’ train” that was then able to halt at Alrewas Railway Station. If darker gossip about the exact nature of their relationship had been aired over a pint in the Royal Oak in Bromley or one of the several hostelries that served the small population of Alrewas and the more numerous travellers passing through, then it would later prove to be well founded. Murder “at Orgreave”. That was how the incident was headlined in the Lichfield Mercury that Friday. It was their job to make a sensation of their news stories. Their readership would have made the mental connection, even without the reminder that the editor included in the reporting, with the nationally notorious murders carried out by Tommy Bond in a cottage in Orgreave some 40 years previously, within living memory of many local people. In fact, the Tollgate Cottage was positioned a little beyond the Alrewas/Bromley parish boundary formed by the winding Bourne Brook that crosses under the road between the two “Lupin” Farms, and was more correctly described in other newspapers as having an address of Kings Bromley. During her brief sojourns in Staffordshire, was Alice told that the narrow stream near her friend’s cottage was called the Bourne Brook? If so, she would have remembered, because Bourne had been her maiden name. 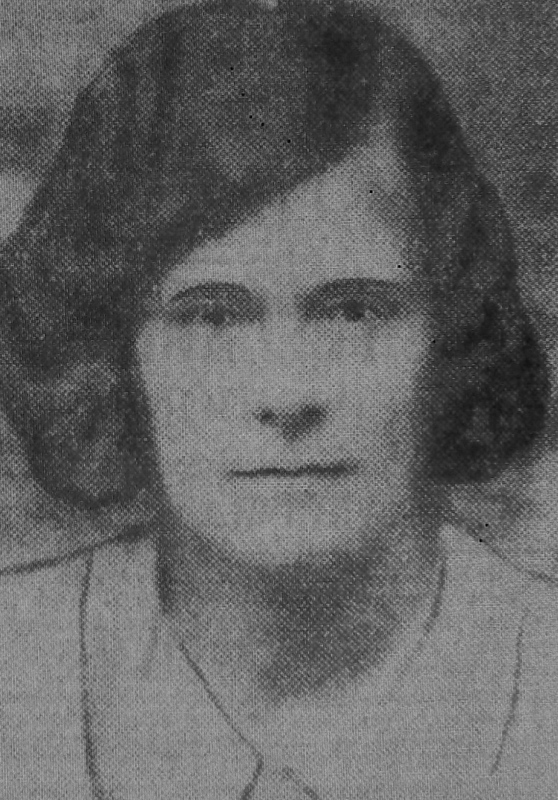 Alice Maude Morris, nee Bourne, from a contemporary press photograph. She might have been pregnant with Cliffe’s child. His self deception was completely shattered, and as he struggled vicously with his wife to retrieve a second letter which she would not let him read, his fury empowered him to inflict what the Coroner later described as the “extensive injuries” with the flat iron, which killed her. Judge and jury were satisfied that the shock of this sudden revelation was enough to temporarily deprive Morris of his sanity, and mitigate the crime to manslaughter instead of murder, and Morris was sentenced to five years hard labour for his misdemeanour. Today, as in 1937, the Tippers are still farming at Lupin, and the Hills at Orgreave. Like the Morrises and William Cliffe the latter are originally from our neighbouring county of Cheshire. In the 1930’s, the youngest of the Hill family were able to safely make their way along the the road to school in Kings Bromley in a pony and trap, and much of the other traffic comprised cyclists – pedalling not for recreation, but out of necessity. Near the site where the Old Tollgate Cottage stood, the road has changed course. A sharp bend that someone must have deemed dangerous, but which actually had the effect of slowing most traffic down, has been ironed out, and its old surface is used to stockpile highway surfacing. Of the cottage itself, no trace remains above ground level, bar scattered fragments of rubble and the broken detritus of domestic life. The Bourne Brook still goes babbling through, intersecting the road and dividing the parishes, insouciant. Received, sincere and helpful advice during her “confinement”, by my mother in 1961. That she has preserved it thus some indication that the time holds happy memories for her? This funny baby did not appear as pink and cherubic as the illustrations on the cover of the instruction manual that it came with. But a few hours had now passed since my birth. The angry bruising around my face had begun to subside, along with the memories of any previous lifetimes. The nurses at Bloxwich Maternity Home deemed I was finally fit to be presented to the other end of my mother. 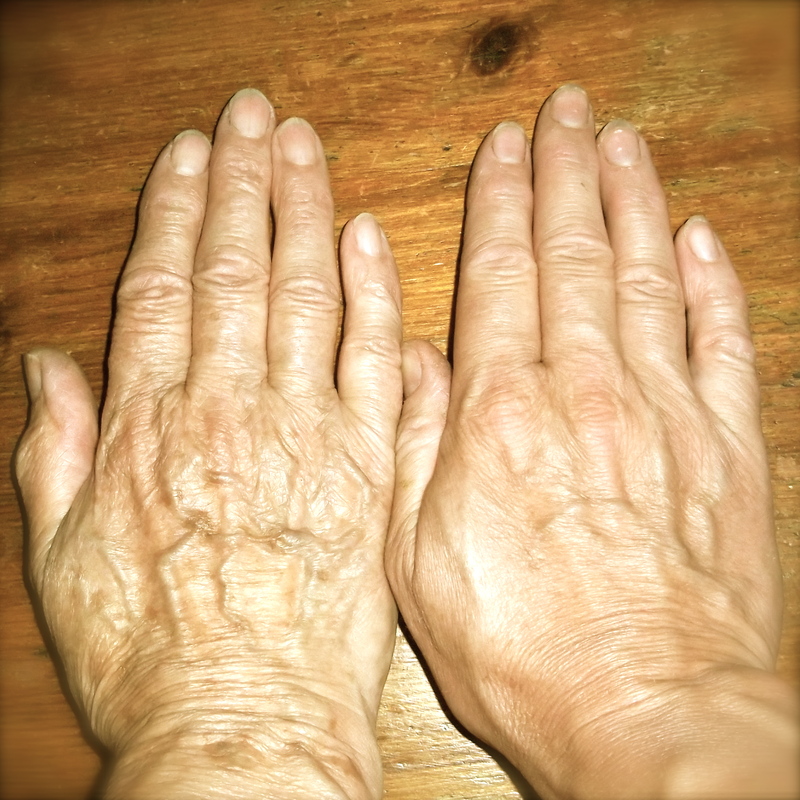 A matching pair of right hands – but separated in age by 31 years, 9 months and 24 days. “Oh, she looks just like her father, the poor little thing!” it is claimed that she expostulated, when presented with what she had to make do with forever – her only offspring. Then she noticed the miracle of my little hand, the index and the ring finger curved inwards, and the little finger discernibly bent at the top joint: an exact miniature replica of her own. My hand, my good fortune. From this alliance you could prognosticate a happy carry-on without reference to the auspicious, graphically pleasing, upsidy- downy year in which I arrived – 1961 – or to the lines on my palm. Any fool could see this was the best of starts in life that, having fallen to Earth, it was this particular woman who grasped my matching mitt – and held it tightly through my infant vulnerability, only to lovingly unfurl her fingers and let go when I was ready to stand steadily. Now I take her hand and steady her through our precious remaining years – we are going to move in together. Her sisters – my aunties – don’t share our twisted digits. Kathleen’s long fingers and smooth spoon-shaped nails are nothing like ours. Irene’s – once daintily manicured and ladylike when she was a glamorous young manageress at Dorothy Perkins – have been coarsened by a subsequent half a century as a hands-on farmer’s wife. This image is a refugee from an eBay sale. The fingers on their own mother’s left hand were a troubling sight to me as a child: my Granny Sheldon’s left hand was crippled, and with the nails horribly deformed into tiny cubes of dark horn. They must have been nimble enough, once. As an industrious young teenager – in 1911 – 14 year old Elsie May Day, of Paddock Lane, Walsall, was a “sorter in a brass foundry”. 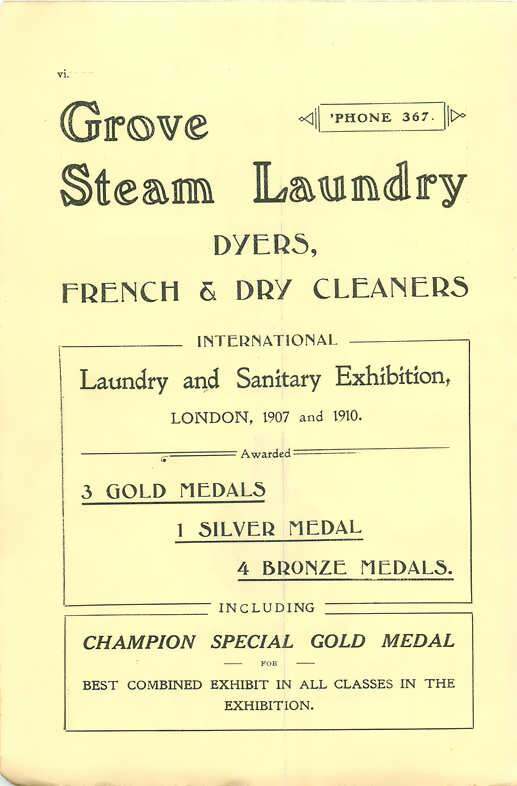 Between then and her marriage and the birth of her first child in 1927, she had a period of employment at the Grove Laundry in Walsall that proved costly to her wellbeing. In those days, gentlemen’s shirts sported detachable collars that could be laundered separately and stiffened with starch. Between its two fearsomely large rollers, a special machine at the busy Grove Steam Laundry was, several times daily, fed with industrial quantities of starched collars. One dark morning my grandmother inadvertently added her fingers to the load. Barr Beacon, late 20’s. My grandmother, Elsie May Sheldon, nee Day, and beloved first-born, my “aunt” Winifred, who wouldn’t, thanks to meningitis, make 16. Here, see the state of the sorry left hand. Sometimes, my mother remembers, the wearing of the wedding ring was sacrificial, gave some gyp. This is a celebration, a rare day out. They had travelled from Walsall to Barr Beacon, remarkable simply for being an elevated vantage point in an area of scarce and modest eminences. It had been opened in 1918 with pomp as a public park following the death of the last of the Scott family, after some centuries as the crowning glory of their estate, centred around Great Barr Hall. It was 10 years since Elsie’s husband had, unforgettably, seen his pals shot to bits before his eyes on the Somme, and at Passchendaele. 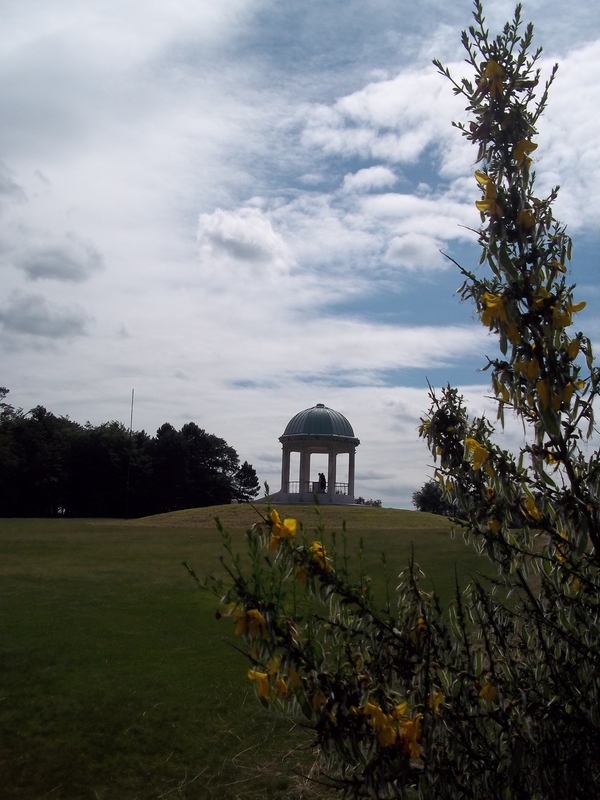 Later, at the very summit of the Beacon, would stand a memorial to the Midland’s fallen. 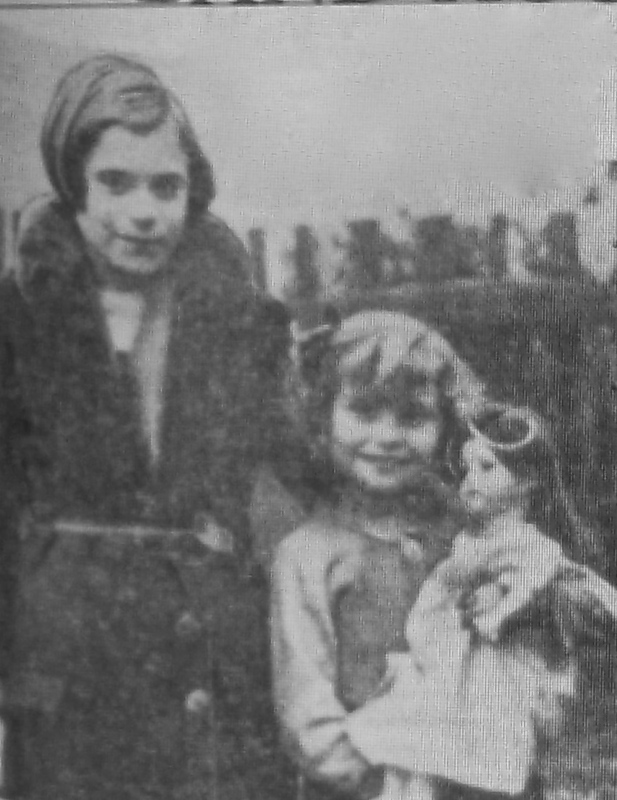 She sits with little Winifred, the beloved first baby, born 1927, and died from meningitis in the midst of the Second World War. We got on famously. I was the only grand-daughter. (Irene bred boys). Just once, we took her with us for our annual holiday at my father’s sister’s farm in North Wales. We shared a room. Her corsets were a fascinating clatter of stays in salmon pink fabric, draped over the chair at the end of our bed. I remember the reluctance with which she returned from the sea air to her house in Walsall. “This hole,” she said, venomously – such an uncharacteristically frank admission that life was an ordeal – and it cut me to the quick, because as much as I loved holidays, I loved my home. My parents finished building the house at 155 Bosty Lane, Aldridge by the summer of 1957. They had, by this time, been married for almost nine years. These had been nine years of a childless, double-income life in rented rooms comprising half of a nice house on Broadway in Walsall. These had been nine years of delightfully carefree week-ends in the country: cycling trips, picnics, or fishing expeditions. They had enjoyed a little money in their pockets and no domestic responsibilities. Now a mortgage had been taken out by the new property-owners in order to purchase the plot of land and the materials for their home (a risibly small sum by 21st century standards), and they decided to begin this new phase of their life with a celebratory fortnight’s holiday in Berrynarbor, North Devon. 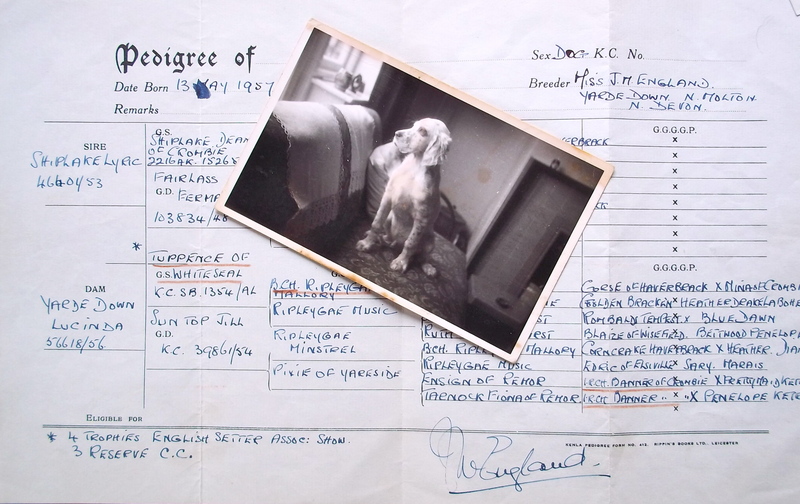 “English Setter Puppies For Sale,” read the chalked sign outside the Poltimore Arms at Yarde Down on Exmoor, as they passed the old pub in their V8 Pilot, and suddenly, unaccountably, they felt more than ready to down a thirst quenching tankard of Shandy. How could they refuse the landlord’s daughter’s invitation only to peek into the outbuildings out at the back, and admire the litter of pups squirming in the straw, just about ready to leave their beautiful mother, Lucinda for lives in their new homes? Inevitably, when they returned to Aldridge, the patter of four furry feet now sounded on the newly laid red quarry tiles in the little kitchen on Bosty Lane, and a soft, silky muzzle nudged Mom’s hand as she finished painting the window frames, (black and white) and stitched up the bark-cloth cushion covers. Dear Simon became my dad’s shooting companion, and as gentle and obedient as you could wish a dog to be – apart from the afternoon he leapt on an unsuspecting lady visitor, whose “visiting hat” was adorned with a cockade of pheasant feathers. This house was furnished with marvellous things, from the perspective of my grandparents on both sides of the family. There was hot and cold running water from the taps, and to store food in, a refrigerator. ( the 1950’s Frigidaire was still in service there when I got married in 1992: ” My word, it’s like the bonnet of a Buick!” said my husband when for the first time he saw the convexly curvaceous fridge door, with its slender, vertical, chromed handle). 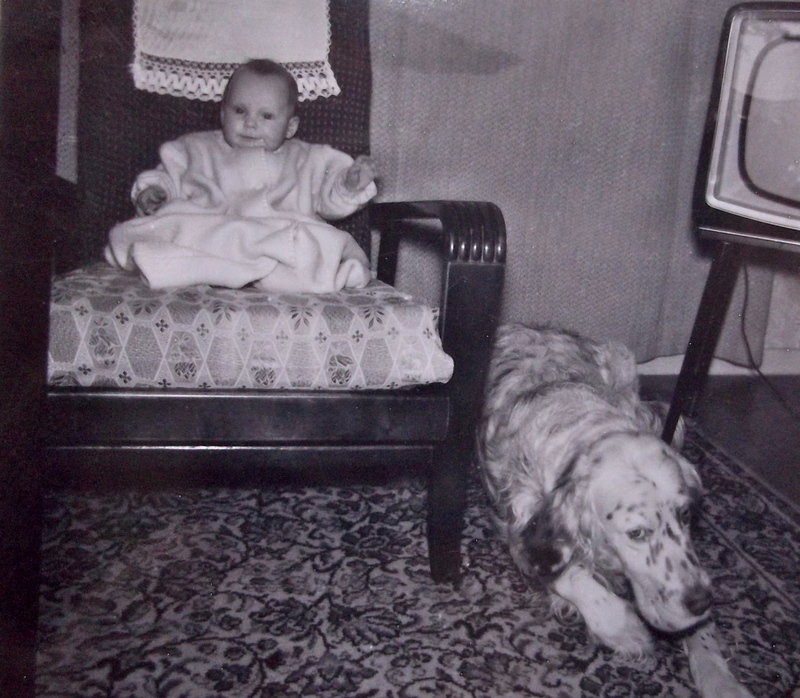 Luxury of luxuries, there was a television, sitting on its spindly “atomic age” legs in the living room. And, considered a necessity because of my Dad’s building business, a telephone was soon installed. 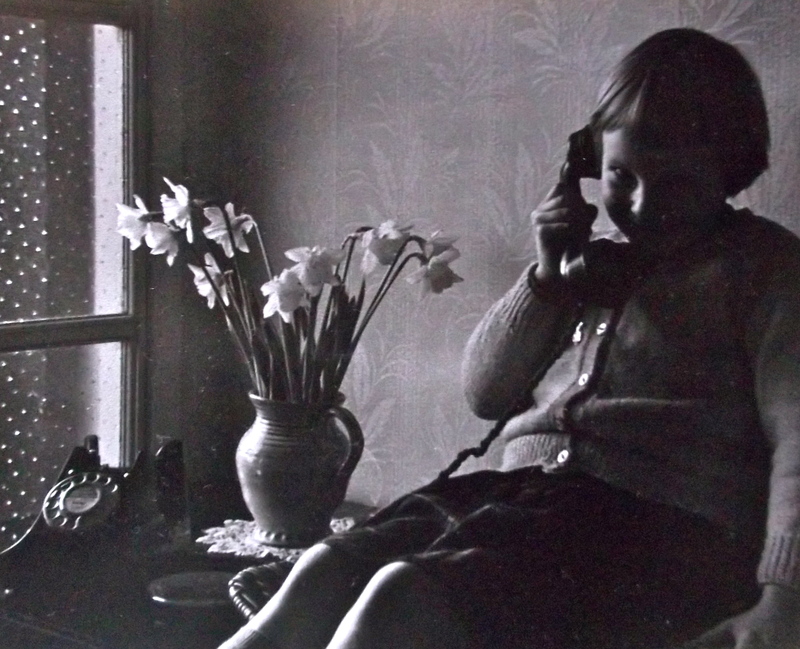 Even twelve years after VE day, post war shortages were blamed for the practice of installing a “Party Line” connection – to the ponderously heavy, black Bakelite telephone receiver supplied to my parents. My parents at 155 shared the line with the Aldridge family at number 143 – perhaps the only other household in Bosty Lane to have a ‘phone in the 50’s. Mr Aldridge of Aldridge, worked as a manager for Rock and Downes builders on the Walsall Road. Clearly, the dangers of not being able to receive out of hours cement or scaffolding queries were taken very seriously by the General Post Office at the time. 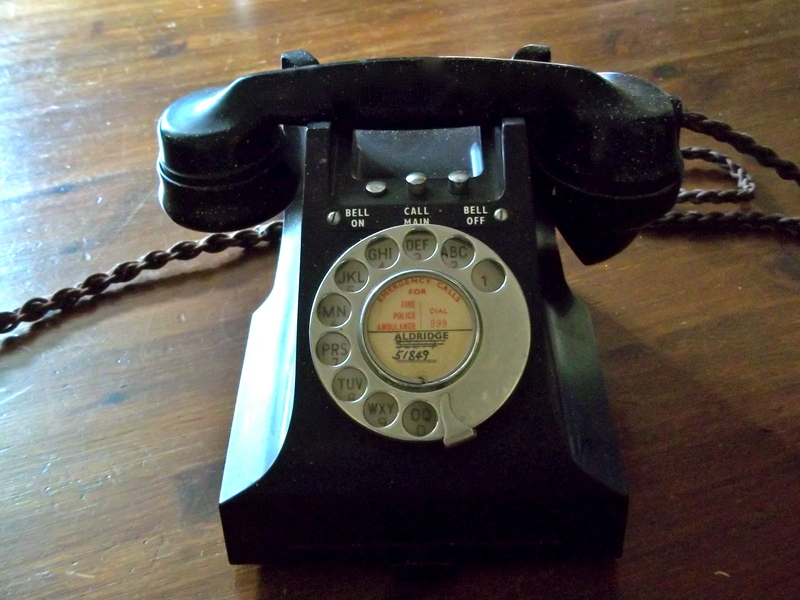 At 3.30 a.m. on the morning of Friday September 8th, 1961, my father woke to hear that telephone emitting its characteristic, rhythmic, shrill, mechanical ring. Some momentous, and long anticipated news was bursting to come through. 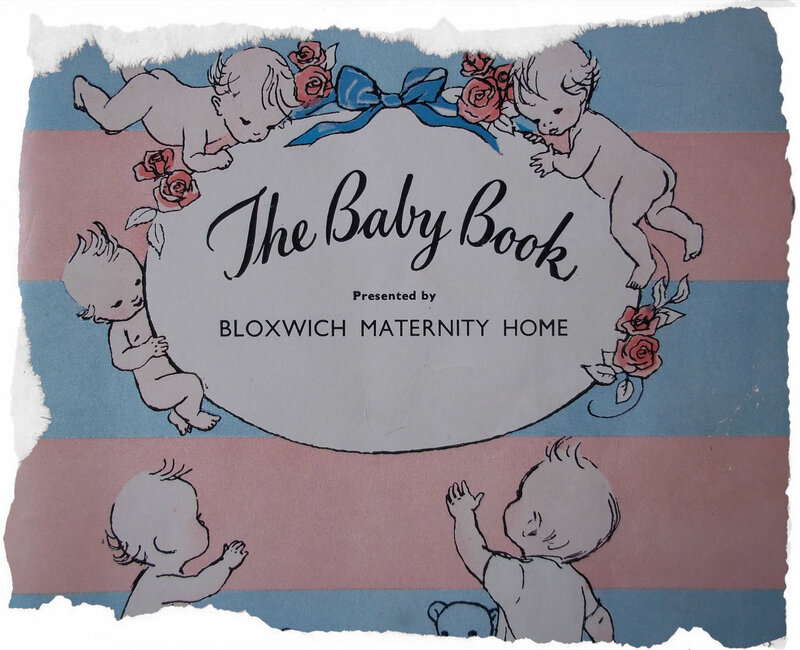 From Bloxwich Maternity home, a midwife was calling him with news of my birth. 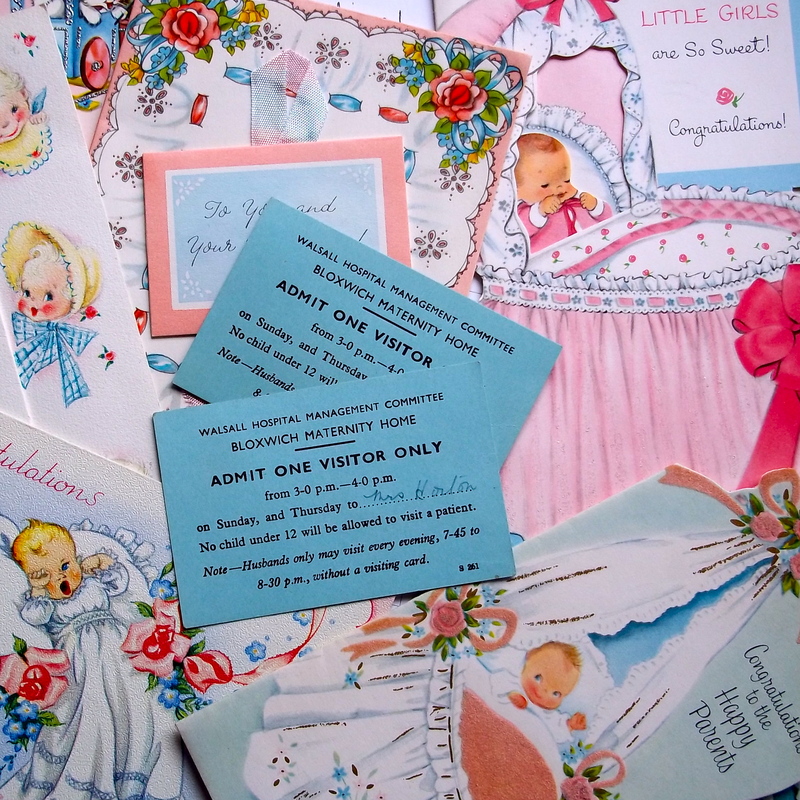 “Husbands only,” we read, “may visit every evening 7-45 to 8-30 p.m., without a visiting card.” – which perhaps accounts for the perfect state of preservation of the visiting cards in my possession. We were soon released from the six-bedded maternity ward at Bloxwich that had once been one of the generously proportioned bedrooms of a wealthy Victoria family’s Italian style villa. The building is still discernible behind a high hedge, and is part of the present day Bloxwich Hospital. Mother and I spent the following – then requisite – several days of complete rest both happily be-pillowed between the dark polished oak headboard and footboard of my parents’ bed at Bosty Lane. Aunty Rene kindly double-bussed it from Stonnall to make light of the housework, and a community midwife attended to us. Mrs Gombridge was that right-thinking professional who seems to have esteemed dogs at least as highly as she did babies. Two large mongrels accompanied her on her rounds, panting and wagging their tails in her little car as she made her calls on new mothers, and her dark uniform was liberally coated with their hair. She put paid to any misgivings my mother had about big dogs and new babies and briskly insisted that Simon should be introduced to his new human immediately. His kind brown eyes watched protectively over me for the next several years. With angelic patience, he suffered my little arms to probe deep into his soft liver-and-pink mouth to retrieve an important piece of Lego that he might have purloined from my play.